Conversion therapy narratives seem to be popular nowadays. (Probably because our vice president actually believes in that hateful nonsense.) We’ve seen it recently in an episode of Riverdale, the upcoming film The Miseducation of Cameron Post will deal with conversion therapy and as we see from the new Boy Erased trailer, director Joel Edgerton isn’t shying away from depicting the abusive practice. Boy Erased stars Lucas Hedges as Jared, a gay teen. His parents, Nancy (played by Nicole Kidman) and Marshall (Russell Crowe), can’t handle it. So his father, a Baptist preacher, sends him off to a conversion therapy program (led by Victor Sykes, played by Edgerton). 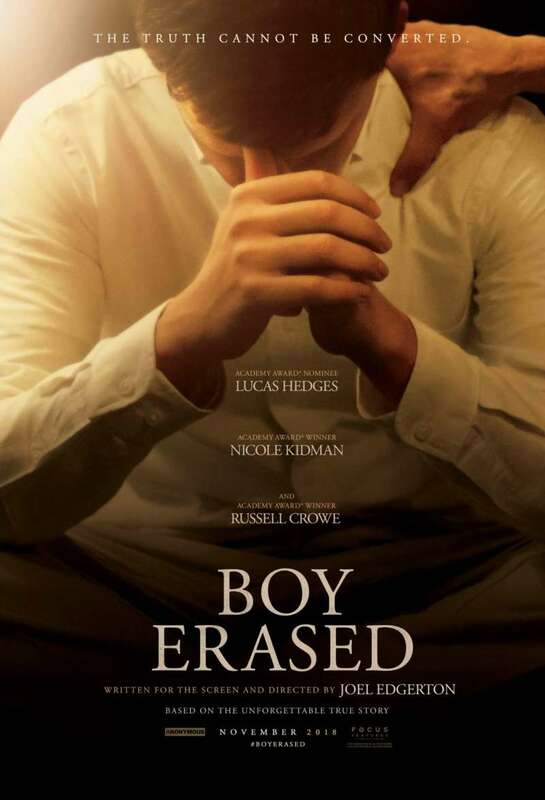 The poster was released at the same time as the Boy Erased trailer. The film also features Troye Sivan, which may be surprising to those who only know Sivan from his music. But he actually started out as an actor — you can see him as James in X-Men Origins: Wolverine and the Spud trilogy opposite John Cleese. Edgerton says he based his portrayal of the Love in Action head on John Smid, the organization’s director until 2008. Three years later he admitted that he’d “never met a man who experienced a change from homosexual to heterosexual.” Smid himself came out in 2011 and married his husband in 2014. What did you think of the Boy Erased trailer?